Are you in need of Bronx tree removal service or emergency tree removal services? When a tree has fallen, or is in danger of falling, you need a tree removal service company on the scene fast! Able Tree Care provides 24/7 emergency tree removal services in the Bronx. 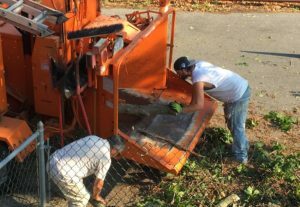 Able Tree Care provides safe and affordable tree removal service in the Bronx. Our tree service company is ready to serve you in a moments notice. This is especially important when property owners in the Bronx are in need of emergency tree removal services that can’t wait until the next morning, or even an hour! Waiting could be catastrophic, and that’s why you can count on Able Tree Care for all of your tree service needs. When are some times you may need tree removal services or a local tree company to come and inspect your trees? Here in the Bronx big storms or harsh winters can cause major damage to your trees. After every storm or winter it is wise to have Bronx tree experts come and inspect your trees as they are able to spot trouble that you won’t be able to see. Sometimes tree removal is not needed as simply trimming your tree branches or cutting large tree limbs will do the trick. But don’t take a chance and hope that your tree is ok, doing so can lead to disaster to your property and to those who live around it. We can be onsite fast and inspect your trees, and provide you a free onsite estimate if any tree service or tree removal is necessary. Our Bronx tree company has over 25 years of local tree service and tree care experience here in the Bronx. Many Bronx property owners have our telephone number on speed dial. Trusting our Bronx tree experts with the care of your trees, property, and lives of those who live around your trees is a major responsibility and one we don’t take lightly. We are your Bronx Tree Removal Service Company.